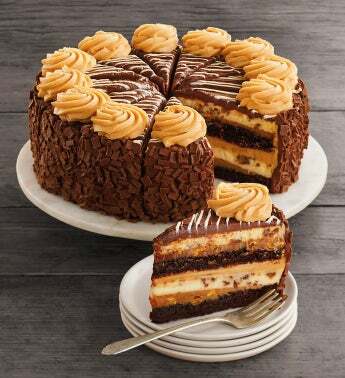 The REESE'S® Peanut Butter Chocolate Cake Cheesecake is an irresistible addition to the lineup of cakes from The Cheesecake Factory® we now offer online. Crafted with chunks of actual peanut butter cups, this rich chocolate peanut butter cheesecake is complemented by layers of fudge cake and gooey salted caramel. Featuring peanut butter cream cheese rosettes and a layer of rough-chopped chocolate pieces along the outside edge, this pre-sliced cheesecake delivery is a delicious treat for any occasion.